Jill Marks, NativityMiguel’s Spanish teacher, is remarkable for more than her warm smile and her dedication to the students. For one, she’s a volunteer. As a CPA by day, and with three children spanning in age from college to grammar school, Jill is busy in her personal and professional life. Yet she finds the time to volunteer at NativityMiguel as the Spanish teacher on both campuses—mornings with the girls, afternoons with the boys—two days per week. Jill’s story about what initially drew her to NativityMiguel is personal. When her oldest son was a student at Canisius High School, he was in a language class with a NativityMiguel graduate. At the time, NativityMiguel didn’t have a language program, and her son could see that his classmate struggled in class to keep up. It was this experience that captured Jill’s interest—and led her to decide that she would volunteer as the school’s Spanish teacher. Teaching was a profession she’d considered but never pursued. 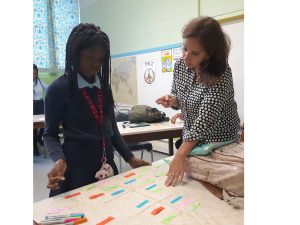 As a foreign language teacher for NativityMiguel, she could help the school’s graduates become better prepared for high school. Jill has been teaching at NativityMiguel for five years now, and she finds it deeply rewarding. She recalls many of her students, including one that would eagerly take out an index card (to make a flash card) every time she introduced a new word. 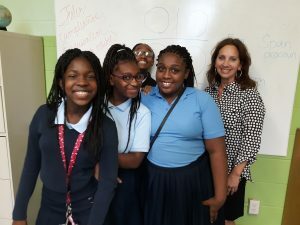 About teaching, she says, “When the lightbulb goes on [for a student], it’s worth it.” Knowing that the time she spends makes high school easier—and success more attainable—for NativityMiguel graduates is the payoff for Jill. To learn more about our volunteers, please visit Our 2018 Annual Fund page and become part of the mission they support. Thank you!